What is it? I have seen several references here on the Board, but I can't find anything specific. Is it just taking big stitches versus trying for tiny ones? Do you use a different type of thread? Different needle? Inquiring minds want to know! At least, my mind wants to know! The way I understand BiG Stitch is to use emboidery floss and make larger stitches but they have to be perfectly even. It gives a primitive kind of look. I beleive it is more decorative than meant to hold the layers together. Perle cotton, size 8 or 12, works better than embroidery floss. Stitches are usually about 1/8" on the front and 1/4" on the back. It's fast, easy, looks great on many things and has no problems holding the layers together. It's also called the utility stitch. It has a great old fashioned look to it. All kinds of info available online. I do that on some quilts. Yes, it can give a rustic and organic feel. It is easy; I did this one last fall. I used Pearle Cotton #8 (red), also I used a hoop. I believe this is also called "utility quilting." I have a friend that does this on a lot of her quilts and uses crochet thread since it comes in so many different colors. What a great idea! Does give a very "comfy" look! Like your quilt, Grammy! Thanks for the tips. I have thought about this technique for a flannel quilt I am working on. Now I know what to do. Those web sites are great! But it's intention, regardless, is to hold the sandwich together. Just another way to do it. Have made several quilts using this technique but mainly baby quilts. One of the galls from our quilt group calls it "cave man quilting". It is a nice relaxing job to do while watching TV. Really do like the looks of it. So, if I use this type of quilting, can I still wash the quilt as usual and it will hold together? Yes it just a different style of quilting. The "big" stitches really aren't that big-about 1/8 to 1/4 inch. They still give you the quilted look and hold everything together. I've done sevral quilts this way. My grandmother made quilts this way years ago using crochet thread. My sister still has the one that GM made for her. It's still fine after 50+ years. lady in my group did this as a whole cloth quilt. It was stunning. I have done it on a few quilts and really like the look. Years ago I did regular hand quilting, but after having hand surgery 10 years ago, I can't really do the fine hand quilting/sewing anymore so when I do feel like quilting by hand, it is utility stitch quilting for me. It isn't hard to do, goes a lot faster than traditional quilting. I use the pearl cotton and a chenille needle to do the stitch. Sashiko quilting is very similar to "big stitch quilting". Sashiko uses a white thread - reminds me of what we used to use for candlewicking, sort of like a crochet thread #10 wt. - and the quilting designs are rather organic, specific to Japanese fabrics and symbolisms. In the nineties, my shop often taught classes on "big stitch quilting" and found many used it in quilts made of Civil War reproduction fabrics, among other things. It became very popular. 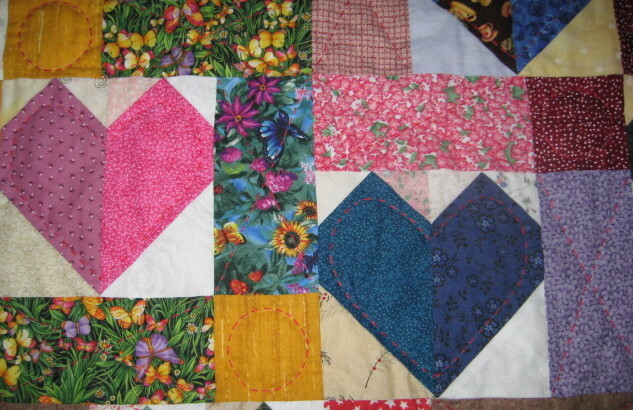 The designs we used were just like any other regular quilting design -- feathers, waves, grids, flowers, outline, etc. I now usually use only the big stitch method because I have enough nerve damage in my hands to make feeling the needle a bit of a problem. With big stitch I can use a larger, easier to hold needle and thicker threads. I've quilted with crochet #10, perle cotton balls, and Sulky cotton 12 wt. I prefer the thread to compliment/contrast the fabrics and cause the quilting patterns to add to the texture and patterns of the fabrics, to be very noticeable rather than somewhat hidden in the quilt. My needle preference is Richard Hemmings large-eyed betweens in the 3-9 size packets. I use the larger needles in the packet. The thread allows 5-7 stitches to an inch rather than aiming for the master standard of 10-12 stitches. As always, consistency of stitch is more important than stitch length. Wish I had good pictures of the quilts I've done, including one that was a commission for a lady who had done beautiful candlewicked blocks several decades ago. She was thrilled with the look of it. I tried hand quilting on flannel and finally gave up and machine quilted (it was a small lap quilt). Love the tute! Very detailed! I'm seeing more and more of this on modern quilts too. i love how it adds color and contrast and is also obviously done by hand which is a major plus. I've never heard of this, but Googled it and it looks very interesting. Thanks for sharing. Tutorial was good. Her work looked very clean, orderly. Less pressure. Never tried it, but I love Grammy Dwynn's quilt! Thanks for the sites,I really like chasing cotton.Trying to get brave enough to hand quilt, was very helpful. A lot of the younger quilters in my area do the bigger stitch quilting, but with regular quilting thread. They have referred to it as "country quilting". I myself like the smaller stitches on a quilt, but that is a matter of personal preference. I can do the smaller stitches, but am soooooooo slow doing it, have been giving country quilting a thought, but when I set down to do it, I just can't make the bigger stitches. Most I have seen are about a quarter inch on top and bottom and I can see where this would go much more quickly, but my needle just wants to make those smaller stitches. One of the ladies in our area makes the tiniest stitches when she quilts, and her quilts are amazing, especially the whole cloth quilts she has done. She has won numerous awards on her quilting, so my goal is to be like her (which will never happen). She started quilting at 11 or 12 years old and is now 78, so she has had a lot of practice. I think whatever 'busts your buttons' is okay as there are so many ways of doing things and I am so glad we don't have to follow rigid rules that "this is how it should be done". I would never make it doing that!